Greek bailout talks: Here’s one way to avoid ugly fights over sovereign debt. And neither does the next one. That’s why we should consider creating an international bankruptcy code for indebted countries. An amateur? Greek Finance Minister Yanis Varoufakis attends a press conference with German Finance Minister Wolfgang Schäuble following talks on Feb. 5, 2015, in Berlin. The Greek debt crisis is like the movie Groundhog Day, except it doesn’t look very likely to end with an epiphany. It’s not surprising that, once again, talks over extending the country’s bailout stalled at this week’s meeting of eurozone leaders. The current points of dispute involve pension, labor, and other reforms, which Greece must pledge to enact before the eurozone will offer funds to keep the nation’s government running. Among politicians and bureaucrats, there has been an endless cycle of derision, threats, and grandstanding while the Greeks face a revolving door of rising unemployment, poverty, and homelessness and as hospitals, schools, and other public-sector institutions remain understaffed. It’s only getting worse: Greece is still in danger of defaulting on its remaining loan repayments and being forced to exit the eurozone. On Monday, Athens paid about 750 million euros to the International Monetary Fund, which helped bail it out in 2010 to stanch the country’s government-debt crisis. (The funds Greece used came from the IMF’s own reserves.) It still owes the IMF 1.5 billion euros in June and almost 7 billion euros to the European Central Bank, another creditor, by the end of summer. For months headlines have pitted a hapless, newly elected Greek government against exasperated eurozone officials waiting for Greece to toe the continent’s austerity line. In March, German Finance Minister Wolfgang Schäuble said that his Greek counterpart, Yanis Varoufakis, is “foolishly naïve.” Privately, eurozone officials accused Varoufakis of being a time waster and amateur. 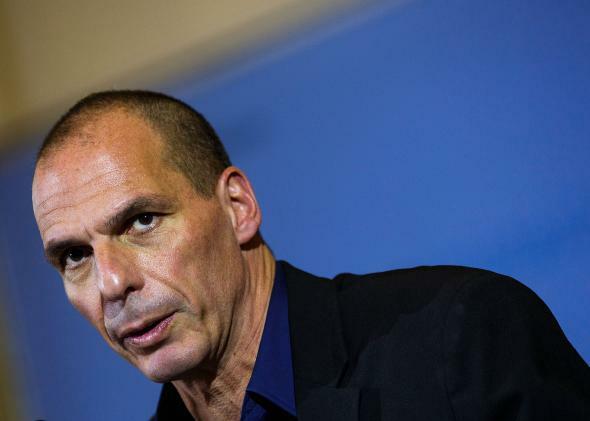 Varoufakis and Greek Prime Minister Alexis Tsipras have accused the ECB of blackmail and invoked World War II while demanding reparations from the Germans. The public acrimony has dissipated somewhat, but bitterness clearly still simmers below the surface. But does it have to be this way? What’s become clear over these months of brinkmanship, stalled negotiations, and last-minute partial deals is the appeal of a global framework for restructuring sovereign debt—one that allows for flexibility for private creditors but also ensures that debtors aren’t exploited. In other words, Europe and the rest of the world should consider an impartial bankruptcy code for countries. If the continent had had one, we might have avoided our current scenario, in which power politics have helped ensure the viability of austerity, a program that has lessened Greece’s public spending to low-single-digit deficits but worsened the economic lives of its citizens, and repeatedly brought the country to the brink of defaulting on its debts. Everyone knows that bailouts have become overly politicized. The U.S. bailout during the financial crisis, which cemented “too big to fail” in the public consciousness, triggered hostility that helped spur a Republican landslide in the 2010 midterms. Now imagine if every one of the 900,000 or so commercial and consumer bankruptcy filings in the U.S. last year triggered bailouts. Creditors would eventually elbow each other for repayments; mayhem would ensue. In Greece the bailout has been marked by malfeasance, infighting, and decision-fumbling. A 2013 IMF report claimed that the fund underestimated the problems austerity might cause to the Greek economy and that Greece did not qualify on three of its four criteria before receiving the initial three-year, 30 billion-euro loan. The report also noted that the stimulus prioritized the health of Europe’s banking system over the Greek economy. For example, an early debt write-off was delayed for political reasons because of countries whose banks held Greek bonds. Debt restructuring, or an effort to renegotiate the terms and provisions of a debt, could be a valuable alternative to bailouts, or transfers of finances by a governmental body to rescue an entity that is not meeting its financial obligations. That’s because creditors aren’t impartial. Take the European Central Bank. It’s an invested stakeholder in the current standoff, with a 104 billion-euro exposure that roughly equals 65 percent of Greek’s GDP. In a way, it’s understandable that in early February, the ECB’s Governing Council removed a waiver that allowed Greece’s banks to post government debt as collateral for cash. But that led Greece to become reliant on emergency funds to stay afloat. Greek stocks then fell by as much as nearly 30 percent the following day, and depositors triggered a bank run. There have been many increases to the emergency ceiling, which is now 80 billion euros. The ECB has similarly strong-armed Ireland and Cyprus. It’s not that the ECB is wrong to pursue rules that benefit the eurozone; the terms of Greece’s bailout could still be changed midstream, but doing so would create legal headaches and other complications for the eurozone. It’s that while bailouts may evoke a rescue operation of sorts for sovereign debtors, they can play out far differently. When countries like Greece risk going bankrupt, it can be an opportunity for bottom-feeding purchasers of distressed sovereign debt. Such private creditors, especially short-termers, might then either hock to another entity such as the ECB or IMF or hold on to assets and litigate until they recover those assets’ value. There ends up being not much of a rescue, but financial power plays that favor certain interests and assets over others. That has been one of the big criticisms of the Greek bailout. In March an IMF director reportedly told Greek’s Alpha TV that rescue funds were used for banks in France and Germany rather than to keep Greece afloat. A restructuring framework might have avoided such abuses. But during the Greek debt crisis six years ago, restructuring wasn’t considered. So it’s worth noting other efforts underway to handle sovereign debt. The IMF has flirted with a sovereign bankruptcy arm for years, although any such regime would present conflict-of-interest concerns since the IMF often is a creditor or is closely associated with creditors. And last month the United Nations Conference on Trade and Development released the early stages of a legal framework for sovereign debtors. As the UNCTD report states, “The absence of an international forum dealing with the resolution of sovereign debt problems has led to decisions being made across a range of institutional settings at the local level and the expense of global coherence.” The report concluded that sovereign debt restructuring could have helped avoid the kind of self-interest that has plagued the Greek debt crisis and other sovereign debtors. Any debt restructuring regime would be complex. The UNCTAD framework provides a series of steps leading up to the decision to restructure, taking into account political costs, fear of economic contagion, liquidity, and access to capital markets. Once a debtor state opted for restructuring, it would have to choose a forum. (For example, the existing 20-member Paris Club has been the go-to forum to resolve debts owed to other states, but it’s technically just an informal group of creditor nations.) The stages of verifying claims, interim financing, and other concerns would depend heavily on the kind of debt that was issued and who the creditors were. But the upshot is such a regime would make the process less rancorous and susceptible to abuse because the rule of law it offered would provide more consistency, timeliness, efficiency, and objectivity. Efforts to create a new sovereign debt framework are hardly apolitical, of course. In the wake of the Supreme Court’s deferral to a 2nd Circuit Court of Appeals decision allowing U.S. hedge funds to demand that Argentina repay a debt in full, sovereign debt restructuring reflects a slowly growing movement of international finance away from Washington. The Treasury Department probably would be tepid about such an international body. In a way, bailouts that lack the nuance of an emerging sovereign debt restructuring framework reflect the state of capitalism. They are useful if the debt is sustainable because they prevent economic harm from spreading. This is nothing new. And there’s nothing wrong with a market for sovereign debt. Indeed, debt has created markets since ancient times. The federal government assumed and consolidated state debt after the American Revolution. Wall Street was founded on debt when Alexander Hamilton and others got into the speculating business. Balance sheets in corporate America are riddled with it. But any witness to the perils of the Greece situation knows that bailouts can go seriously awry. An option for sovereign debtors to forgo a bailout could take away some of the sting.